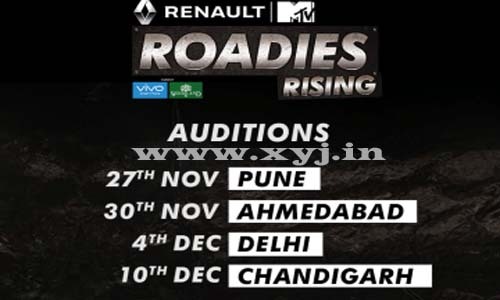 MTV Roadies is one of the most popular youth reality tv show of India and they are all set to taking auditions for Roadies X5 season 14 in following cities Pune, Ahemdabad, Delhi & Chandigarh. The audition for Roadies X5 will starts from Pune, 27th of November 2016 and below is complete details about the audition date and venue. Well before you visit the audition venue of Roadies X5 please carry an valid photo ID proof such as Voter ID Card, Aadhaar Card, Pan Card, Driving License, Passport etc. instead of this must carry latest passport size photograph for MTV Roadies 2016 auditions. You will get the audition form at venue itself which you have to fill on the spot however online application form is not started so for the same you have to visit the venue it will come first serve basis so reach on the venue as soon as possible as the gates for the audition will open early in the morning at 8.00 am and below is audition details. kapil sir i want come MTV Roadies Rising X5 Audition plz give me details sir..
and how to Registation ? audition details are mentioned on the website once the venue confirmed we will publish on our website too.